This question is in regard to the favorites list that is the, I believe third tab, on the phone call section. Does it display all people contacted or just people called and are they in order by frequency or just any random order? 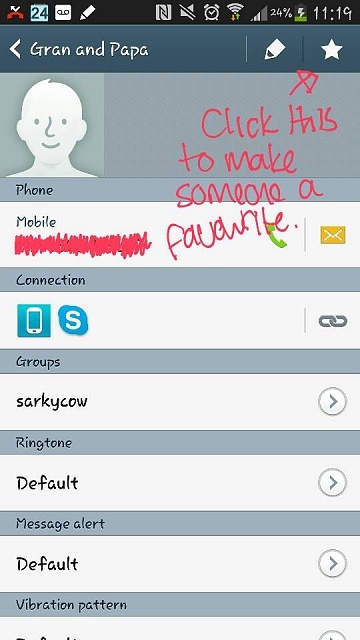 You can set people as favorites so that you don't have to search for them in your contacts. If you go into your contacts and click on one you will see a little star on the top right corner - click on that and that person will be made a favourite and show up first on the favourites tab. Those I believe go in alphabetical order. The sub tab I guess that says frequently contacted doesn't seem to be in an order, on my phone anyway. I've included a screen shot of making someone a favourite. If you're on the favourites tab you can also hit menu>>add to favourites and then click on which contacts you want to add (this is better if you want to add a bunch of people at once). M8: How do I add phone numbers to favorites? What's your favorite app for privacy safety? Where are my favorites in IE?